Added by Bill Bowman on April 12, 2019. Residents listen as Mark Healey, the township’s principal planner, describes proposed zoning ordinance changes. Zoning ordinance modifications that tweaked a few spots in the township were further tweaked before they were adopted at the April 9 Township Council meeting. The changes – affecting properties outside the Canal Walk development, at the intersection of Mettlers and Weston Canal roads and some properties on roads off DeMott Lane – were meant to fix anomalies that did not make sense from a planning perspective, said Mark Healey, the township’s principal planner. 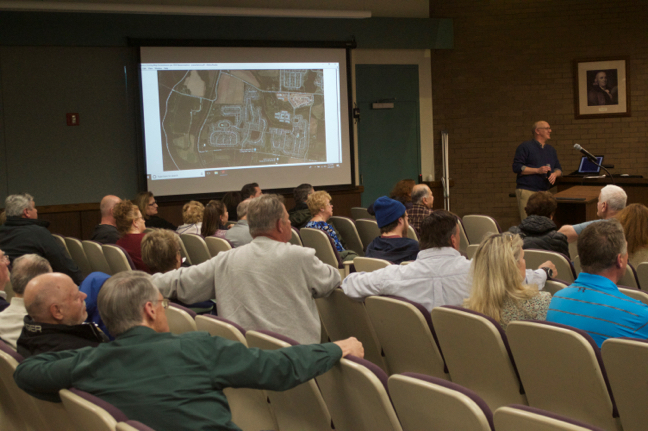 The meeting attracted a contingent of Canal Walk residents unsure of how the changes would affect them – they will not – and also property owners on Gates and Ellison roads who were concerned that the changes would devalue their land. The changes were recommended in a re-examination of the township’s Master Plan, Healey said. The suggested changes that were not adopted involved a number of properties at the end of Gates and Ellison roads which fall in the R-20 Zone. R-20 zones allow building houses on a half-acre of property. The suggestion was to change their zoning to that of R-40, which requires a minimum 1-acre lot for residential development. That would have made the lots immediately non-conforming, and would have affected property owners’ abilities to add decks or install pools because of the different site regulations. Several property owners asked the Council to leave the zoning as is because of the negative effect the change would have on property values. Their plea was heard by Councilman James Vassanella (D-Ward 5) who came prepared with an amendment to strike from the ordinance the zone-changing section. Vassanella said he had “a variety of concerns” about the proposed changes. “From a fairness perspective, I personally just think … We need to take a closer look and make sure we’re being fair in handling it in a way that doesn’t disrupt what in some cases are generations of people living there, and all of a sudden, we’re pulling the rug from under them,” Vassanella said. Vassanella’s amendment was adopted, prior to the adoption of the overall ordinance. Regarding the property lying along the perimeter of Canal Walk, Healey said the changes would take those properties out of the Senior Citizen Village Zone, where they do not belong. “There are a few properties that are not included in Canal Walk,” he said. Some have single-family homes on them, others are undeveloped land. “That’s the zoning those properties were in before they were put in the Senior Citizens Village Zone,” he said. A number of smaller properties, roughly about an acre each in size, would stay in the SCV Zone, he said, but would be protected by language in the zoning ordinance which attaches to them design requirements of the R-40 zone. A number of Canal Walk residents showed up to ask questions about the proposed changes; they were all assured that the changes did not affect property within the walls of Canal Walk. The final piece of the changes is at Weston and Mettlers roads, in the Research Office Laboratory zone, near Colonial Park, property that Healey said was recently purchased by Somerset County for use as open space. “We have a recommendation in the Master Plan that if the state or county or township preserves lands, we should put it in the least dense zoning district,” which is the Agricultural Zone, he said.